Because my last blog post was the hardest and most personal I’ve written, I had to step back and take some breathing room before following up. I’d struggled with opening up—being so vulnerable and disclosing. As a shrink, I walk a fine line. Over the years, I’ve selectively shared my stories with patients when they’ve felt relevant to healing. But I’m still new to sharing my most personal experiences with others, especially in a public forum. On the day my last post came out, three people unsubscribed before noon. I’ve tried not to let that matter, but of course it does! My “unsubscribers” reinforced the messages most of us get about what we should not talk about. But statistics support the importance of talking about depression and suicide. Nearly 40,000 Americans die by suicide every year, and it is the second leading cause of death for ages 10-24. If we want to better understand depression and help lower these appalling statistics it is time to be brave, step up, and join the chorus. She told me I helped her understand that, “He didn’t to this TO us, he did it FOR himself.” She said reading my blog articles “made a difference in my life this evening. A lovely difference.” Beautiful words from a courageous woman. Just as I had to go back and piece together the complex circumstances surrounding my suicide attempt, I had to do the same thing to discover what helped me survive depression. In doing so, I was surprised to see that, at sixteen, I instinctively took actions that were self-empowering. I recognized what I had control over and I took action. That time in my life led to the three things I still find to be most empowering—those I use in my life and teach my patients, and those that saved my life when I was living in Saudi Arabia. The importance of meaningful interpersonal contact. The importance of physical exercise. Life isn’t always easy. I’ve lived an interesting and complicated life—surviving accidents, cancer, divorce, financial disaster, losses of friends and family, heartbreak, and sorrows I never imagined I could survive. The gifts of time and perspective allow me to recognize all I would have missed had I not survived at sixteen. I have had so many incredible experiences and I have so much love in my life. And life continues to unfold for me in amazing ways. Last Monday I had an exciting experience I hope to be able to share sometime soon. Friday night I attended a book club and met fifteen lovely women who had read my novel. And Thursday night I saw Garth Brooks live in concert! But, most important, every day I have the profound joy of knowing I am able to touch the lives of others in a meaningful way. I am grateful. Please read my blog post, Silence for ways to be with and help those who are grieving. Please contact the American Foundation for Suicide Prevention www.afsp.org for more information on understanding, preventing, and coping with suicide loss. If you wish to read more of my story on how I made it through, please read my piece title After the Storm. 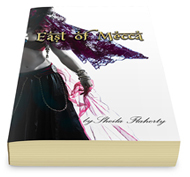 Finally, I invite you attend a special reading from my novel East of Mecca at The Book Stall in Winnetka, Tuesday, Sept. 30 at 7:00 p.m. More information about the event can be found here. You are such a gifted, thoughtful writer. I should tell you more often how much I appreciate your words and insights. Thank you. (it cut me off) ….about ‘the’ Monday!